Flu vaccine delivered through painless microneedles in patches applied to the skin could soon be an alternative to delivery through hypodermic needles, according to researchers at Emory University and the Georgia Institute of Technology. Using new grants from the National Institutes of Health (NIH) totaling approximately $11.5 million over five years, researchers from the two institutions plan to develop a new vaccine product using the microscopic needles. "A vaccine administered through a skin patch would have a number of advantages, including less discomfort to the recipients, lower cost and reduced production time," says Richard Compans, PhD, professor of microbiology and immunology in the Emory School of Medicine. "Potentially, individuals could administer the vaccine to themselves, perhaps after receiving it in the mail." The Georgia Tech and Emory team plans to develop and assess the effectiveness of transdermal patches that include arrays of microscopic needles containing or coated with vaccine. They hope to design patches that could be stored for long periods of time at room temperature and that will increase the breadth and duration of immunity to influenza -- perhaps with smaller amounts of vaccine. "We expect that this research will lead to a better way of delivering the flu vaccine, which will allow more people who need it to receive the immunization in a convenient and effective way," says Mark Prausnitz, PhD, a professor in the Georgia Tech School of Chemical and Biomolecular Engineering. "Beyond that, the possibility of replacing a hypodermic needle with a microneedle patch should significantly impact the way that other vaccines are delivered." The project team has extensive experience in microneedle development, influenza vaccines, vaccine delivery systems, product development and interdisciplinary collaboration. Beyond influenza, the research could have implications for immunization programs in developing countries, where eliminating the use of hypodermic needles could make vaccines more widely available and address the problem of disease transmissions caused by the re-use of conventional hypodermic needles. In April the NIH awarded a $32.8 million, seven-year contract to Emory, along with the University of Georgia, to establish the Emory/UGA Influenza Pathogenesis and Immunology Research Center, for which Dr. Compans is principal investigator. The center is working to improve the effectiveness of flu vaccines through a number of different projects studying how influenza viruses attack their hosts, how they are transmitted, and what new immune targets might be identified for antiviral medicines. 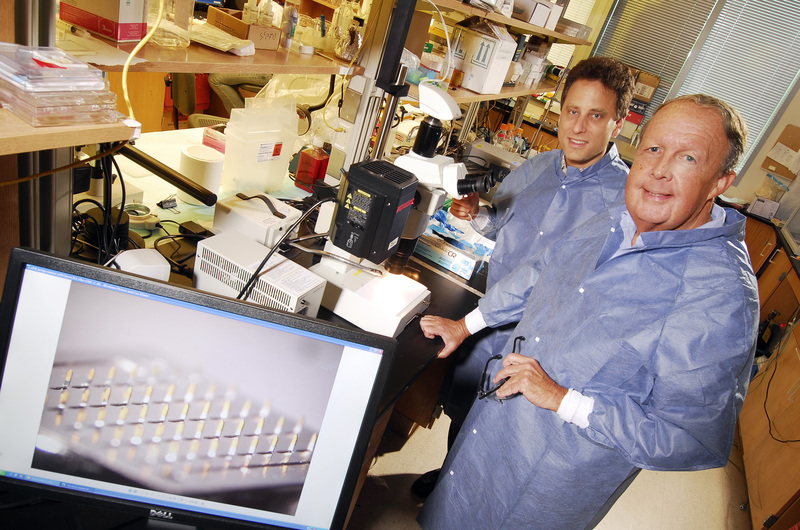 Dr. Prausnitz and his colleagues have been working since the mid 1990s to develop microneedle technology for painless drug and vaccine delivery through the skin. Much smaller than conventional hypodermic needles, the microneedles in the arrays are made of titanium, stainless steel or various polymers -- including some that could dissolve into the skin, carrying vaccine with them. The Georgia Tech team has also developed manufacturing processes for microneedle patches and tested the ability of the needles to deliver proteins, vaccines, nanoparticles, and small and large molecules through the skin. "We expect microneedles to be less painful than conventional hypodermic needles because they are too small to significantly stimulate nerve endings," says Dr. Prausnitz. "The NIH grants will allow us to move forward with perfecting the manufacturing pro cess, refining the techniques for optimally inserting the microneedles into the skin and ensuring that vaccine delivered this way produces the necessary immune system response. Replacing hypodermic needles with microneedle patches could significantly impact the way that vaccines are delivered." Dr. Compans and Dr. Prausnitz are the principal investigators on these grants. Other members of the microneedle research teams include Emory microbiologists Joshy Jacob, and David Steinhauer, Chinglai Yang and Ioanna Skountzou; Georgia Tech micro-electromechanical systems (MEMS) bio engineers Mark Allen, Harvinder Gill and Vladimir Zarnitsyn, and pharmaceutical scientist James Birchall at Cardiff University.